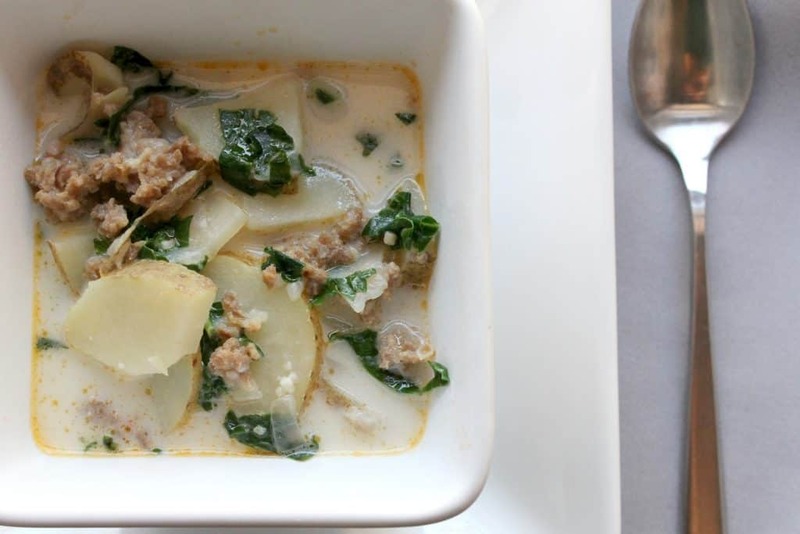 This Instant Pot Zuppa Toscana is made in the pressure cooker! This frugal one-pot meal is super quick, easy and full of flavor! Disclaimer: This post may contain affiliate links for your convenience. If you make a purchase, this site may receive a small commission at no additional cost to you, which helps to offset the costs associated with running this site. You can read my full disclosure policy here. When I was spending summer breaks at home during college, my family and I would often go out shopping or to run errands together on the weekends. My dad enjoyed stopping for lunch at Olive Garden for their unlimited soup, salad, and bread sticks. These lunch stops were a favorite of mine, too! That was my first introduction to Zuppa Toscana, and minestrone, and pasta e fagioli. Mmmmmm. These days, I very rarely actually go to Olive Garden, though, because I’ve learned how to make some pretty stellar soups over the years. Homemade soups are so much better than what you can buy in a can, and they are much less expensive than what you can buy in a restaurant! I love to make homemade soup with leftovers or whatever ingredients I have on hand, as a way to stretch my grocery budget and reduce food waste. 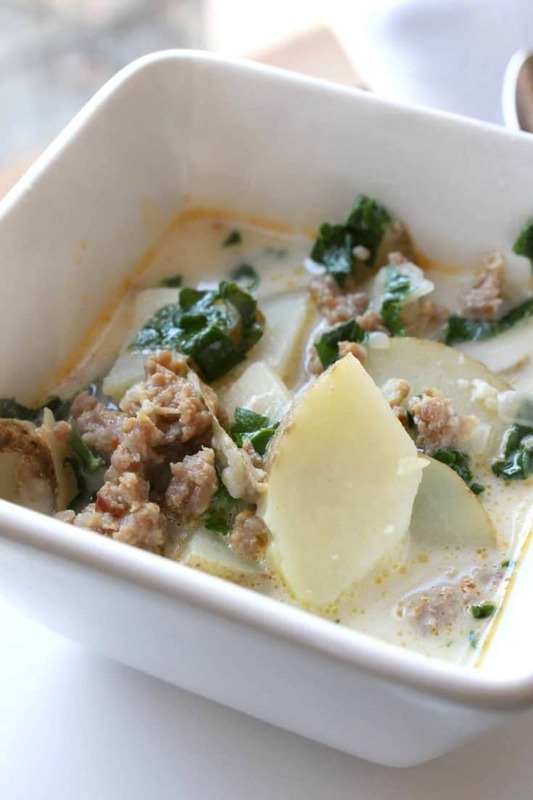 This Instant Pot Zuppa Toscana, which I’ve adapted from This Old Gal is one of the most recent soups I’ve made for my family, and we LOVE it. It’s been added to our meal plan rotation and I make it about once every two weeks. I just love how easy (and fast!) it is to make this in the Instant Pot pressure cooker. I’ve made a couple of slight changes to the original recipe–I don’t use the bacon because I don’t feel it’s necessary (the soup has plenty of flavor without it!) and eliminating it also decreases the cost of the meal. Using ground sausage that’s already out of the casings is my preferred method, mostly because sausage casings kind of gross me out. 🙂 I use mild sausage and find it to be plenty flavorful, but I’m kind of a wimp when it comes to spice. So if you prefer a spicier version, use spicy sausage. 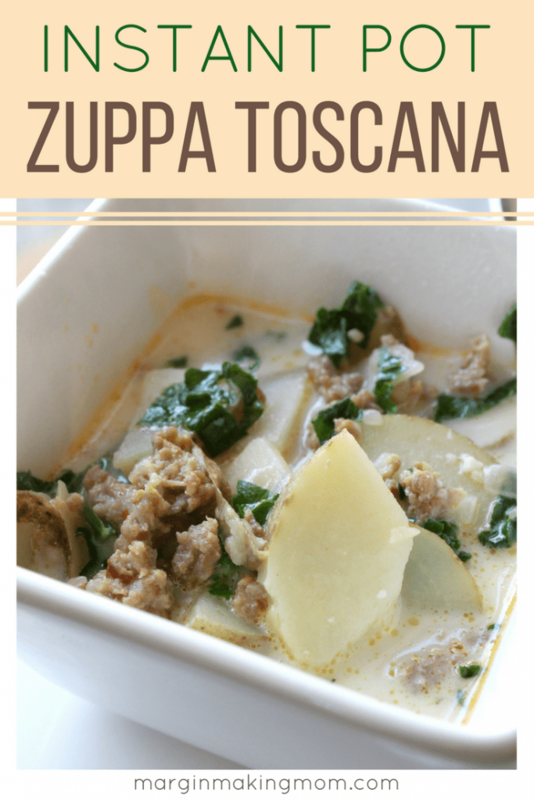 This Instant Pot Zuppa Toscana is also a simple one-pot meal, which automatically makes it a winner in my book! You can cook the onions, garlic, and sausage in the insert pot using the Saute function prior to pressure cooking the soup. It is remarkably simple and only requires a handful of ingredients, but the flavor is out of this world. Because it only requires a handful of common and fairly inexpensive ingredients, this is also a frugal meal option. I’m always on the hunt for quick, easy, cheap, and tasty meals, so I’m glad I found this one! 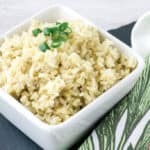 For more inexpensive Instant Pot meals, check out this list of 40 cheap and easy Instant Pot Dinners. I love making meals in the Instant Pot because it simplifies my life. Meal prep is so much faster and easier. What busy mom can’t use more of that in their life, right? In fact, you should check out my tips for making the best Instant Pot soups and see just how easy it is to make your favorite soup recipes in the Instant Pot. To start off, you’ll cook some onions in the insert pot of the Instant Pot, using the Saute function. Add in the ground sausage and brown it well. Add in the garlic and cook it for another minute, until it’s nice and fragrant. While the sausage is cooking, slice some potatoes. Leave the peel on them, because that helps them hold their shape better. Drain off excess grease, then add the potatoes and broth. Lock the lid in place and turn off the Saute function. Select a 5 minute cook time at high pressure. While that’s cooking, go ahead and cut the kale. The kale does wilt and get soft, but it holds up MUCH better than spinach typically does. The kale is chiffonade, or cut into thin ribbon-like strips. My recommendation is to stack several kale leaves on top of each other and roll them up. 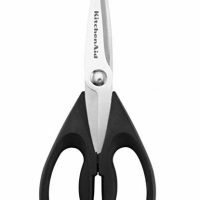 Using kitchen shears or a sharp knife, cut the roll several times, which will result in thin strips. Once the cook time is complete, allow a 10 minute natural pressure release, followed by a quick release of any remaining pressure. Once pressure has released and the valve has dropped, carefully open the lid. Add the kale to the pot and stir it, allowing the heat to wilt it. Then stir in the cream. I love this soup with a sprinkle of parmesan on top and some crusty bread or homemade dinner rolls and a salad on the side. It’s a hearty comfort food perfect for this time of year. 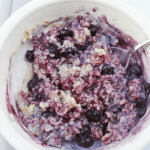 Add it to your weekly meal plan and give it a try–it’s a winner! Learn how to convert slow cooker recipes for the pressure cooker! 3 large russet potatoes, unpeeled and sliced into 1/4-inch slices. Using the "saute" function of the Instant Pot, heat the olive oil. Add onions and cook until they begin to become translucent. Add garlic and allow to cook just until fragrant, about a minute. Add potato slices and chicken broth. Lock the lid into place and set to "sealed." Cook at high pressure for 5 minutes using the Manual setting. When cooking is complete, allow a natural pressure release for 10 minutes, followed by a quick release. Pour in cream or half and half (or milk), stirring to combine. I love seeing recipes come to life "in the wild"--don't forget to tag @marginmakingmom or use #marginmakingmom on Instagram so I can see your creation! Information is calculated automatically and is not guaranteed for accuracy. Hey, I had a question do u out the meat and onion into pressure cooker as well with chicken broth and potatoes? Or u add them after with kale and half&half?? Hello! I would like to double his recipe! I was wondering how long I would put it on high pressure for in the instapot? Thank you! I made this last night with spicy Italian chicken sausage and it was delicious! Thanks for the recipe! Would this recipe work with frozen kale? I’m out of fresh kale! Hi Trevor! You can make it on the stovetop- most of the steps are similar only you would simmer it (instead of pressure cooking it) until the potatoes are tender. You may need to use more liquid, as stovetop cooking tends to result in more evaporation than pressure cooking. Coconut Milk works great! Just tried it and can’t even tell the difference. Thanks, Christi! Did you use whole fat canned coconut milk , or the refrigerated type? canned coconut milk, shaken well! We too are dairy free and use cocconut cream in place of half and half – it’s delicious!!! Made this the other night using half & half and spinach I had on-hand instead of kale. It was DELICIOUS!! I put some crispy bacon pieces in each bowl to garnish and it added extra flavor and texture. 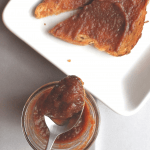 Thank you for sharing this recipe– my whole family, ages 4-67, enjoyed it! I just made this and it was so delicious! I used spinach instead of kale and vegetable broth instead of chicken. I will definitely be making it again, thanks for the recipe! Turned out great! My only criticism is the bacon is missing if you make it like Olive Garden. I was missing it. But still a great recipe! Hi! This is my favorite soup so I’m excited to make this! Question: I want to double the recipe. I have an 8qt IP. Do you think that will be big enough? Thanks! Hi Marie! I’m honestly not sure if you can double the recipe and fit it in an 8-qt IP. I think you could probably do 1.5x the recipe pretty easily in an 8-qt. Either way, just make sure you don’t fill the insert pot more than 2/3 full! If you can double it and stay within that parameter, then go for it! 🙂 Hope you enjoy it! 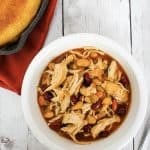 This soup is one of my kid’s FAVORITES! our personal family change is that I add navy beans and use ground sausage with sage. The beans make the soup more filling without having to double the recipe. This looks delicious! Thank you for sharing I’m trying to decide whether to buy an Instant Pot, so I’m researching recipes now, and I will definitely print this one and add it to my stack. Would you mind sharing with me how you do the nice printable recipes for your blog? I occasionally share recipes on mine, and I really like how simple and straightforward the printables are on yours. Thank you! Hi Stephanie! 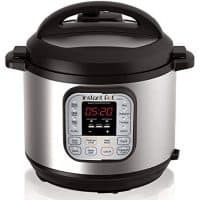 I love my Instant Pot–if you decide to get one, let me know how you like it! 🙂 I use a WP plug-in to create the printer-friendly recipes. There are several options, but I use Zip Recipes. Hope that helps! I cannot wait to try this! do you think I could use escarole instead of kale? 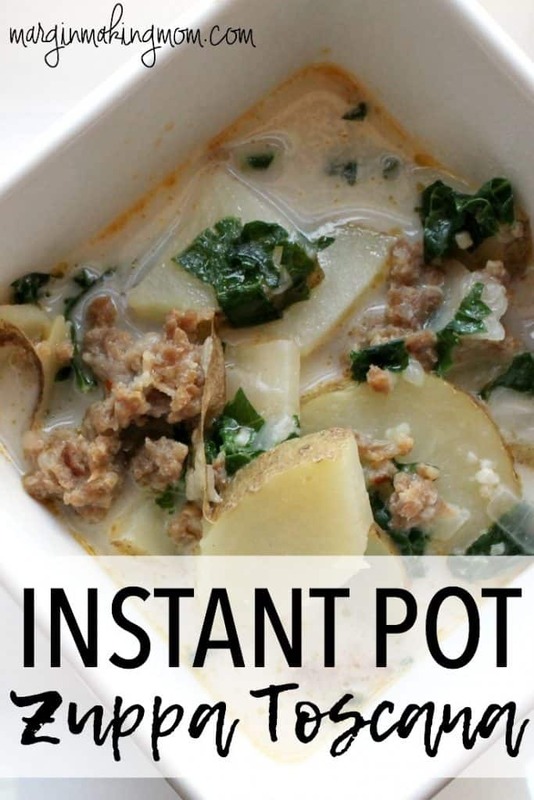 This was my second time using the Instant Pot and this was delicious! I did add a bit of chicken bouillon and some red skinned potatoes for color… but otherwise followed to a T. Thank you for a easy and delicious recipe! Awesome Recipe! We just got an instapot and my son requested this soup for dinner. Everyone loved it! Super easy to make too. I doubled the recipe and followed it to a t. This is a keeper! Garlic bread is the perfect addition–yum! Sometimes I toss a few croutons in mine, too. 🙂 I’m so glad your family is enjoying it! 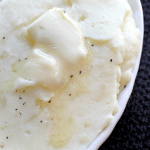 This was my first REAL meal in my Instant Pot and it was so easy and delish! Made this today to take to a get-together this evening. Chose your recipe over several others and it was perfect! No need to look any further!!!!! Thank you!!!! Looks good! Would the three quart Instant Pot have enough capacity? We have a six quart as well but me being ancient, I prefer the smaller one. Would you change anything if I used Swiss chard, (which is abundant in our garden)? I have childhood dislike of kale. Hi Gary, I think you’d have to probably cut the recipe in half for it to fit in the 3-quart pot. My guess is that the recipe as written would exceed the maximum fill of the pot. I think Swiss chard would be great instead of kale! This was absolutely delicious! Hubby loved it even though he is leery of anything with greens in it. I will be adding this one pot meal to my RV glamping menu this fall for sure. Thanks for sharing! This may be a stupid question, but what ground sausage do you use? Ground Mild Italian from the meat case or the rolled breakfast sausage? I read one comment that used the sausage with safe & guessing that’s the rolled breakfast sausage? Thank you! Thank you for your quick response! Like you, I don’t like the casings so I’ll be looking for the ground sausage! I just bought an InstaPot last night. This was my first attempt at a meal today. It was absolutely delicious and tasted much like the Zuppa Tuscana from Olive Garden. 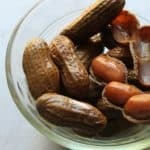 I would recommend this recipe to anyone looking for new recipes ! 5 stars! Oh so good!! I’ve wanted to make this for a while and finally did! It was so yummy, can’t wait to eat the leftovers the next few days!! Curious, cannot be frozen? Thank you!!! Totally recommend this! Hi Jenna! Thank you–I’m so glad you enjoyed it! 🙂 I have not personally tried freezing this particular soup, but I do think you could freeze leftovers. The texture will be a little different after thawing (the potatoes will break down more during freezing and reheating), but I think it would work fine. How did it turn out? Hopefully it worked out ok! I made this today and the instant pot took about 20 minutes to finish preheating. Then it cooked for five minutes. Then it warmed for two hours. My soup was a big pile of mush What did I do wrong? This recipe is incredibly easy and absolutely delicious! Thank you!! This is a winner in our house. I have a toddler, so I dont have hours to spend making meals. This is quick, easy and everyone loves it. We have been making it twice a month! What do you think about freezing it? Hi Erika! Thank you so much for your kind words–I’m so happy to hear you all are enjoying it! I totally understand how difficult it is to cook when you have a toddler running around! You can definitely freeze it, but the texture will be a little different once it thaws. The potatoes break down a bit and release water during the process of freezing/thawing, so the potato pieces won’t hold together as well, but the flavor won’t be affected. This doesn’t bother me, but I know some people are big “texture” eaters, so I like to mention it. 🙂 Hope that helps! Do you have the calories, carbohydrates, fat and protein breakdown per serving? This is my favorite soup at Olive Garden. Was so happy to find your recipe for the instant pot. I always use HOT Italian sausage when making this, because I am pretty sure it’s whats used in the OG soup. Let me tell you, the first time I made this, I was so happy that it tasted EXACTLY like the soup I get at OG! So, so easy to make your recipe. Thank you for sharing!